New Zealand’s e-commerce boom and the arrival of Amazon in Australasia will accelerate demand for warehouse space in Auckland, and drive the redevelopment of inner-city brownfield sites into “last-mile” delivery centres, says Scott Campbell, national director, industrial and logistics for Bayleys Real Estate. This country’s annual online retail spend is estimated to be $4 billion, and though online shopping represents a relatively small proportion of overall retail spending in New Zealand it is growing at a faster rate than bricks and mortar retail. Campbell says the growth in e-commerce has forced retailers to reassess their property requirements. “To fulfil customers’ orders quickly, they need warehouses, with international studies showing that ecommerce businesses need three times as much warehouse space as traditional brick-and-mortar retailers. Amazon’s entry into the Australian market is set to be a game-changer for retail in the region. The company announced in August that it is opening a 24,000sq m fulfilment centre on the outskirts of Melbourne, and has committed itself to “fast delivery”. Amazon has not said whether it will establish a presence in New Zealand, but brokerage firm Forsyth Barr has advised its clients that New Zealand presents a logical extension to Amazon’s investment in the region. Campbell says location is the key to success. “To stand out in a crowded market, retailers are competing aggressively on reducing delivery times, which is creating increased demand for last-mile logistic,” he says. E-commerce fulfilment is in its infancy, really, and there are a lot of different strategies being employed. One of the more popular approaches is the “hub and spoke”, whereby a main distribution centre — the hub — sends out material to smaller centres — the spokes — for last-mile delivery. Scarcity of land favours this approach. Campbell says we can also expect warehouses to assume some of the characteristics of stores as more retailing activity starts to happen inside distribution centres. New Zealand retailers are already responding to the disruption in the industry. The Warehouse Group — which includes The Warehouse, Warehouse Stationary, Noel Leeming and Torpedo7 — recently partnered with NZ Post to trial a new shipping service for online shoppers, Shipmate, as part of its push to drive e-sales. NZ Post’s network gives it significant last-mile delivery reach and it is talking to a wide range of companies about partnering opportunities. Already, it handles logistics for food delivery service My Food Bag. The launch of Shipmate follows NZ Post’s opening of two processing facilities for logistics services. The 2500sq m Taranaki Operations Centre is a hub for the Taranaki region while the purpose-built 14,600sq m, $8m Southern Operations Centre at Christchurch Airport’s Dakota Park, is a hub for the South Island. Other large logistic facilities include the 35,000sq m centre in Highbrook, South Auckland, operated by Courier Post. “That facility also has a satellite pick-up location closer to Auckland city in Morningside, which is likely to become a popular location with other logistics-type operators as large land parcels for large format developments open up across South Auckland, including the Airport Corridor, Wiri and Drury,” he says. Campbell says competition for land in desirable locations, coupled with the push for last-mile deliveries, will encourage developers to transform land and warehouse stock in brownfield sites into more modern facilities. “Brownfield sites in Mt Wellington, Penrose and East Tamaki will be ripe for regeneration,” he says. Listed property group Goodman says it is intensifying its industrial development programme, and undertaking a significant proportion of new projects on an uncommitted basis, “to address current capacity constraints and to meet forecast demand”. Logistics companies form around 30 per cent of Goodman’s customer base in New Zealand and occupy more than 300,000sq m of space within its portfolio. Chief executive John Dakin says modern distribution warehousing needs to be in the locations close to the end consumer and this is one of the reasons Goodman’s is focusing its industrial portfolio in Auckland. He predicts distribution warehouses will evolve as online retail sales grow. “Existing third party logistics businesses with good distribution channels and/or specialist services will benefit but competition will intensify. We also expect that infill locations, close to consumers and key infrastructure will become increasing sought after,” Dakin says. Amazon is nearly ready to launch in Australia. Amazon’s market entry into Australia has begun with the company announcing it is recruiting “hundreds” of staff for its first fulfillment centre, in South Melbourne. Australian operations director Robert Bruce said the US retail giant would stock “hundreds of thousands of products” at the fulfillment centre – which at 24,000 square metres is about the size of three rugby pitches – and use it to supply customers across Australia. “We will be focusing on offering our Australian customers low prices on a great selection of products and can’t wait to get started,” he said. An Amazon spokeswoman said recruiting had begun but the company had not revealed an opening date. Information gathered by shipping company MWPVL International suggests that the Melbourne fulfillment centre is about three-quarter’s of the average size for its warehouses, hubs and sorting centres. Globally, Amazon has 400 facilities with a total footprint of 144 million square-feet, it estimates. Amazon has declined to say whether it would also supply Kiwi consumers from Australia, which might mean lower delivery costs and shorter shipping times. A report from broker Forsyth Barr said that if Amazon did that, it could help the company build a business with annual sales of between $122 million and $548m in New Zealand within five years. 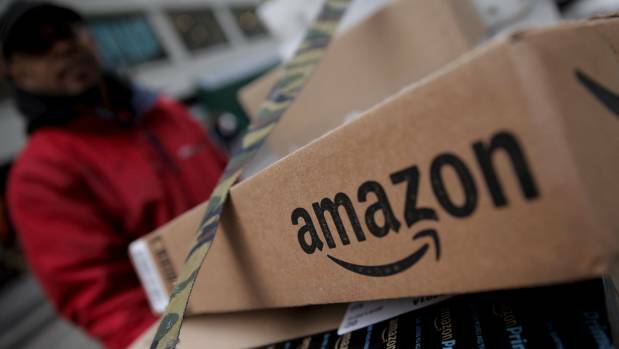 But it would be a “logical extension” for Amazon to move directly into New Zealand, open a fulfillment centre here and offer Kiwi consumers its premium Amazon Prime subscription service which provides free two-day delivery, Forsyth Barr said. That could see it build a business here worth $915m within five years, it said. Overseas, Amazon bundles Amazon Prime with an internet TV offering, Prime Video, which it has launched as a separate service in New Zealand. Forsyth Barr speculated Amazon might outbid Sky Television for streaming rights to All Blacks matches and Super Rugby, if it did launch in New Zealand, to give Amazon Prime a boost. However, there is also speculation Sky and Amazon might strike up a partnership that would see Sky on-sell internet-streaming rights to the rugby while retaining its satellite and free-to-air broadcast rights. Sky TV spokeswoman Kirsty Way said it was too early to comment on any such scenarios. Amazon has been approached for comment.